Would you consider 2,000 degrees F to be hot? At this temperature, aluminum, copper, gold and iron have already melted; stainless and carbon steels are glowing red; and your Thanksgiving turkey would turn into a charred mess in less than a second. So what is so significant about 2,000 degrees? Did you know that many hydraulic systems can create temperatures in this range? Have you ever walked by a hydraulic pump that was cavitating? Once you hear it, you will never forget the signature sound it makes. I describe it as a can of marbles being shaken. What is actually happening is that the pressure acting on the fluid is below the saturation pressure of the dissolved gas (normally air) in the fluid. If the gas bubbles pass through a higher pressure zone (like that found on the discharge side of the pump), they will violently collapse. This alone can cause serious reliability issues with the machine component in terms of vibration, noise, surface damage and potentially failure. The compression of these bubbles in that pressurized side of the pump is adiabatic (not much heat is exchanged between the fluid and the bubble during the nanoseconds of increasing pressure). For example, consider a hydraulic system with a suction-side air leak that lets in bubbles at a little less than atmospheric pressure and 100 degrees F and then pressurizes the fluid to 1,800 pounds per square inch (psi). 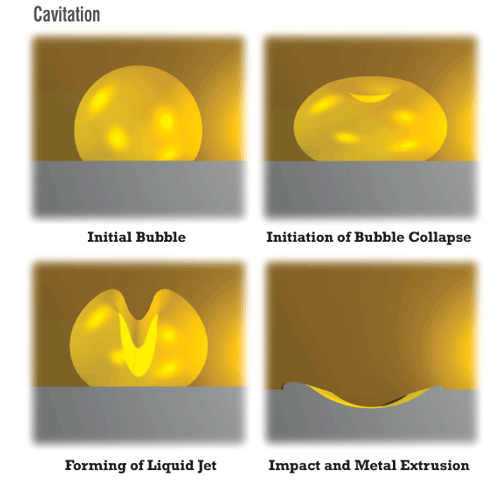 The temperature in this example, which is typical of a hydraulic system with an air leak, would be just more than 2,000 degrees F.
When an air-ignitable mixture is present inside the bubble, ignition is almost inevitable at these incredible temperatures. This is the process known as microdieseling. It will lead to the oxidative degradation of the oil, higher operating temperatures, pressure spikes and the cavitational erosion of the hydraulic pump and other components. Dissolved Air - Air is completely dissolved in the oil and cannot be seen (no clouding). Entrained Air - Unstable microscopic air bubbles in oil. Free Air - Trapped pockets of air in dead zones, high regions and standpipes. Foam - Highly aerated tank and sump fluid surfaces (more than 30 percent air). In layman’s terms, microdieseling is a pressure-induced thermal degradation. An air bubble will transition from a low or negative pressure area to a high-pressure zone and through adiabatic compression get heated to very high temperatures. These temperatures are high enough to carbonize oil at the bubble interface, resulting in carbon byproducts (sludge and varnish) as well as increased oil degradation (oxidation). In the best-case scenario, you would be able to stop the root cause of the problem - the bubbles. If you can control the bubble population, you can control microdieseling.